Many people interested in sport and fitness find that they carry a lot of gear on their travels. Some of this gear needs regular energy boosts. And some of the travels can be way beyond access to niceties like mains power (and fresh food, and showers). Even if your trip away is less extreme, and just involves a weekend in an unfamiliar place, finding mains power when you need it can be a chore. The most obvious way to deal with this is to carry a fully charged battery unit, and there are plenty of those available. But what about also adding in the ability to top that battery up with the power of the sun? That’s what is on offer in the Powertraveller Powermonkey eXplorer, a portfolio of kit which has the potential to keep your equipment charged when mains power is in very short supply. The Powermonkey eXplorer is a serious bundle of kit and there is a range of separate parts to it. The Powermonkey itself is the portable charger. While most portable chargers we’ve seen are boringly rectangular the Powermonkey is distinctively bullet shaped. It has a nicely rugged look about it with grip bars on opposite sections of the casing. My sample was grey and black, but you can also get yellow, blue and pink options if you prefer a splash of colour. 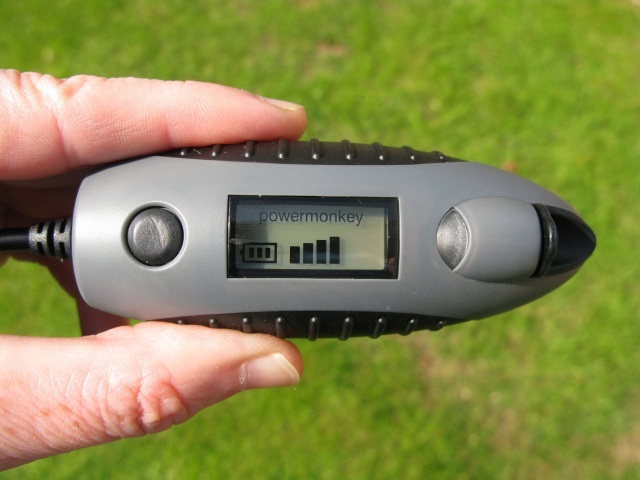 The Powermonkey measures 90 x 45 x 38mm and weighs 83g, so it is small and light to carry. 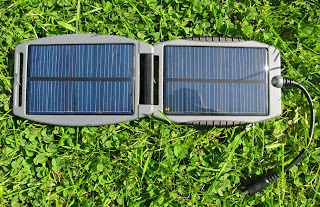 You get the means to charge the Powermonkey via the mains in the shape of a charger with interchangeable heads for the UK, Europe, US and Australia, as well as a retractable USB cable for charging from a power adaptor with USB connector or via a computer – preferably one with sleep and charge USB port so that it doesn’t need to be switched on to charge the Powermonkey. 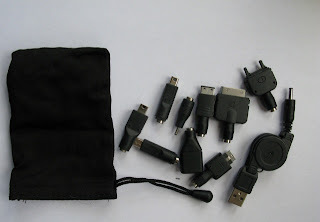 For getting power out of the Powermonkey you get a range of tips for different devices: Nokia and mini Nokia, micro-USB, mini-USB, proprietary connectors for Samsung, LG and Sony Ericsson phones, an Apple proprietary connector, female USB, and Sony PSP proprietary. A neat little pouch can store the tips you actually need on any trip along with the Powermonkey itself though it is not large enough for mains power adaptor too. Still, the mains charger is probably something you’ll leave at home most of the time. I found the retractable USB charge cable was preferable. I use these with a USB-out mains power adaptor for most of my travel charging needs, and so the only extra was adding the Powermonkey’s cable to the micro-USB and mini-USB retractable cables I usually carry. Still, I’d have liked it if the tip were micro-USB rather than round pin so I could double up entirely on this part of the kit. The pouch certainly won’t accommodate the other vital piece of kit you get in the box – a portable solar charger with which you can top up the Powermonkey when a mains socket is nowhere to be seen. 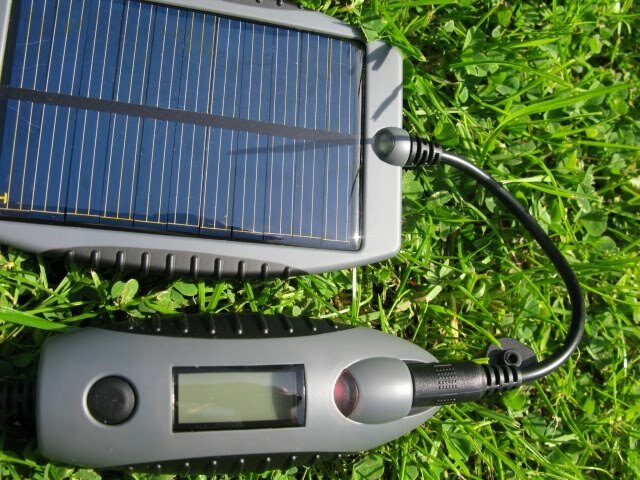 This is the vital element of the Powermonkey eXplorer, and it is known as the ‘solar slave’. There’s no getting around the fact that the solar slave is the largest part of the whole ensemble. When stowed it measures 110 x 70 x 10mm and it weighs 82g. 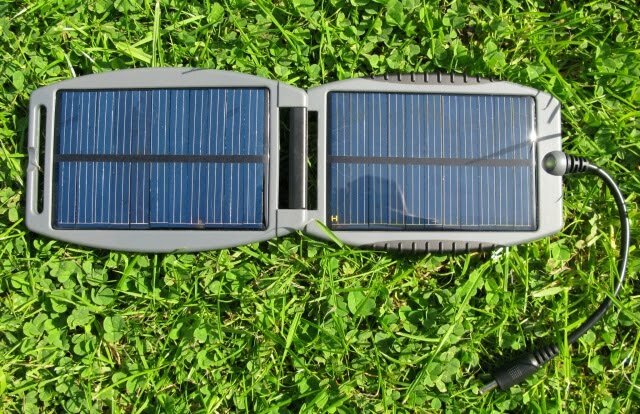 Its two solar panels are encased in a tough plastic that has a pair of ridges like those on the Powermonkey – again to help you get a grip. You’ll appreciate these in cold or wet conditions, I am sure. There is a light on the solar slave that glows green to show it has power – the brighter the light the more power it is generating. So you know immediately whether it is actually capturing any energy. There’s a red light on the Powermonkey that is illuminated when its battery is charging. There is a small LCD screen on the Powermonkey too, and this shows how far its battery is charged using the conventional bars system. You can briefly illuminate the screen using a button that sits next to it. The great thing about the solar slave is its versatility. You can lay it out somewhere at the end of a day’s hike, plug the Powermonkey in, and forget about it. 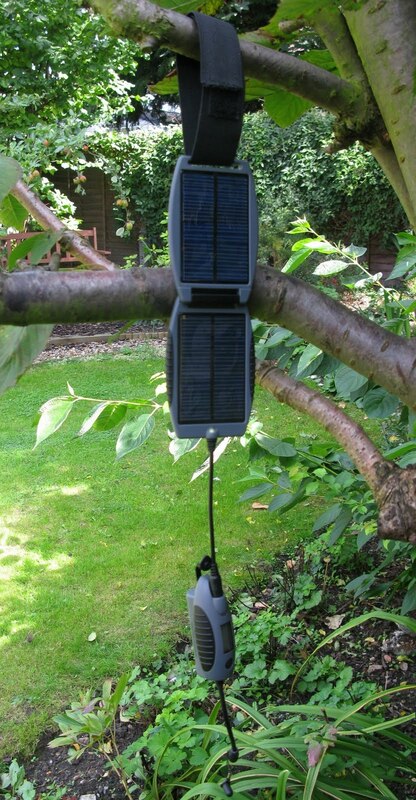 There’s a sturdy Velcro strip you can use to attach the solar slave to a tent, tree or some other structure, to make sure it gets the best of the available sun. You can even hang the solar slave off your rucksack during the day using the same Velcro strip, to maximise its ability to catch rays. If you are clever you can arrange things so that the Powermonkey sits in a rucksack pocket making it secure and ensuring that you don’t lose it during a trek. The Powermonkey ‘power in’ socket is protected by a rubber bung, and when you don’t have something plugged into the power-out cable that too can be protected by a rubber tip. 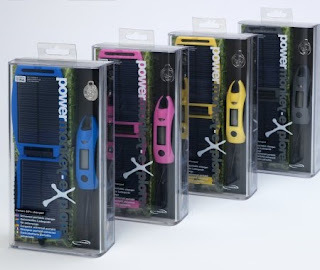 The Powermonkey and solar slave are also water resistant, so you can leave them hanging up and gathering power while you are stationary without having to worry about the odd rain shower or morning dew. The Powermonkey’s capacity is 2200mAh. According to the product information that equates to 40 hours of iPod charge, 96 hours of mobile phone charge, five hours of PSP fun, six hours of MP3/MP4 device and 48 hours of PDA use. 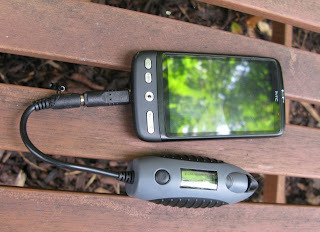 You can also use the Powermonkey to power – but not charge – digital cameras, and it is quoted as good for 1600 pictures. However, take that last quote with particular care. My digital camera can only be powered by its own battery, not by an external source. I used the Powermonkey and solar slave for a couple of weeks before writing up this review and I have to say it has proved quite efficient. I feel quietly confident that a charged Powermonkey and solar slave is all I’d need to keep my mobile phone topped up on a weekend away from home and power. 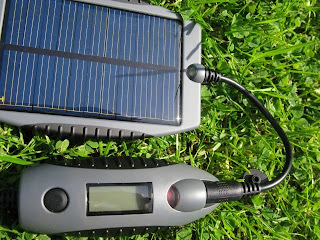 Using the solar slave, though, is not the same as having access to mains power by any means. Yes, it does feed the Powermonkey with energy, and yes, I did find that useful. I tested the solar slave by leaving it hanging in a window and attached to the Powermonkey for the test period. It trickle charged into the Powermonkey rather slowly, and while I got enough power to provide a top up to my phone at the end of sunny days, on very gloomy days I had to resort to the mains for a final boost. Now, to put that into perspective. 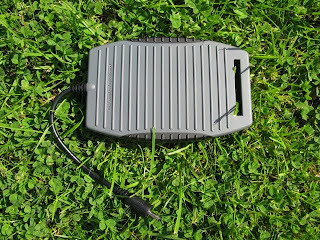 I’ve tried a few solar chargers in my time and never yet found anything that can power my mobile phone entirely without ever needing to use the mains. And I was testing the Powermonkey eXplorer in August in South London – some days were brighter than others! If you are looking for solar energy to be the only source of power for your mobile devices on a day to day basis and want the Powermonkey eXplorer to provide that, then forget it. That isn’t going to happen. Not in the UK at any rate. But if you want top-up power, and are in a location where you actually have access to the sun so that the solar slave can do its job, then you are in with a good shout of getting what you want. The Powermonkey is light, portable, tough and versatile enough to connect with a wide range of devices. 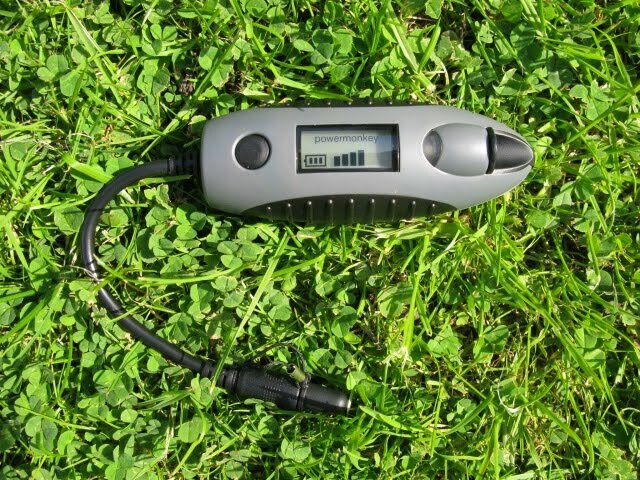 And of course you can charge the Powermonkey before you set out on a trip, so you start out with plenty of juice and then hope the sun will keep it topped up via the solar slave. 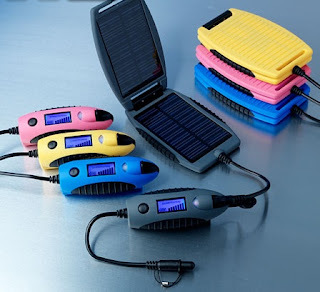 Even if you only use the solar slave rarely, I bet you end up using the Powermonkey regularly, simply because it provides an everyday safeguard against running out of juice for your phone or other device(s) wherever you happen to be.